An EU initiative will facilitate the production, storage, and supply of hydrogen for a wide range of end users, and integrate green power into the energy system. With increasing efforts to cut carbon emissions, electric power from renewables is becoming an important source of energy. Hydrogen in particular is known as a versatile, clean, and safe energy carrier. Its production based on wind power utilising electrolysis – the separation of water into hydrogen and oxygen – is nothing new. However, cost-competitive, and sustainable production of large amounts of hydrogen with this process has proven difficult. The HyBalance project is determined to produce hydrogen on a larger scale from wind turbines with a power-to-hydrogen plant. It will enable the storage of cheap renewable electricity, providing both grid balancing services and hydrogen for industrial users. It will also supply the transportation sector with hydrogen. The EU-funded project’s pilot site was recently inaugurated by Air Liquide, the company that is coordinating HyBalance. According to a report by Phys.org, the electrolyser, have a capacity of 1.2 MW, and enables the production of around 500 kg of hydrogen a day without releasing CO2. The company says the amount is enough for 1,000 cars and can also be supplied to hydrogen buses and forklifts. 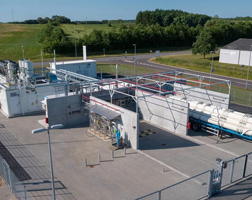 Besides industrial customers, the hydrogen that’s produced will be used to supply the network of five hydrogen stations installed and operated in Denmark. “Wind power is fluctuating and requires adequate flexibility options to ensure balance in the electricity grid. Dynamic water electrolysis offers such flexibility using electricity when the prices are low or there is a need for balancing and transforming it into hydrogen,” quotes the company brochure. To promote green transition, HyBalance will develop business models which will determine when it pays off to turn the wind power into hydrogen. The project will use proton exchange membrane (PEM) electrolysis technology, which is characterised by high efficiency (more hydrogen produced per kWh of electricity). The partners hope that this technology will be fully validated for commercial applications when the project is concluded. The ongoing HyBalance (HyBalance) project was designed to demonstrate the link between energy storage in the form of hydrogen and the deployment of hydrogen mobility solutions, in line with CORDIS.